Shodokan Aikido in Sydney started life as the NSW Tomiki Aikido Club in the Sydney suburb of Willoughby NSW in the late 1970's. In the 1980’s a satellite club was formed by several students at the North Ryde RSL Youth Club, where it continues today as the Sydney Shodokan Aikido. Ray Mazzone Sensei started training in Aikido at the North Ryde Dojo in 1986 and in 1992 became its head instructor, a position he held for 18 years until his untimely passing in 2010. Shodokan Aikido is a style developed by Kenji Tomiki and in reference to him often also referred to as Tomiki Aikido. 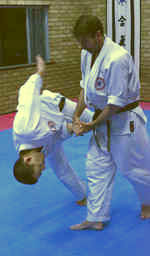 Unlike most other styles it includes a competition element, because Tomiki believed that competing would more than anything else provide feedback about how well their techniques actually work. Morihei Ueshiba is the founder of Aikido. and is therefore often referred to as Kaiso ("The Founder") or Osensei ("Great Teacher").He was born as son of a land owner on 14 December 1883 and in his youth studied a number of martial arts. After his service in the Japanese army, he moved to Hokkaido, heading a pioneer settlement where he met and studied with Takeda Sokaku, the founder of Daito-ryu-aiki-jujutsu. Kenji Tomiki (1900-1979) was one of the early students of Morihei Ueshiba and also of Jigoro Kano, the founder of Judo and in both styles he was eventually awarded 8th Dan, the rank of a Grandmaster. But Tomiki was not only interested in martial arts, he was also a university lecturer and this greatly influenced the way he approached aikido. All instructors at Shodokan Aikido Sydney have trained directly with Nariyama Shihan.